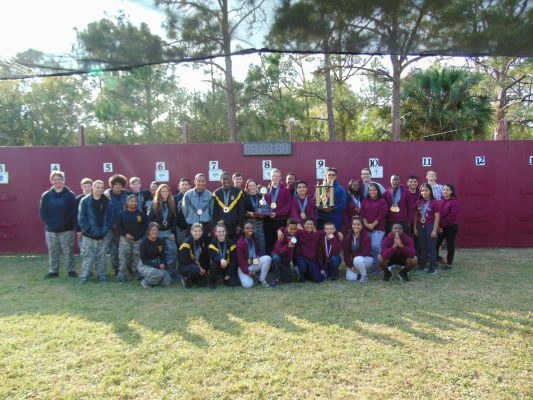 The Panther Battalion Rifle Team swept the competition at the 5th Annual McNair Memorial Air Rifle Match. The veteran team of Alex Rediker, Tae Frazier, Kirmille Joseph and Jose Cristales retained the McNair Cup for the 4th year in a row, posting a score of 1,034 points to defeat six other veteran teams. Alex Rediker was the match champion as well as 1st place award winner in prone and standing and a 3rd place finisher in kneeling out of 31 veteran shooters. Kirmille Joseph was the kneeling champion for the veterans’ competition. A finals event was also added this year, and Tae Frazier took 1st place honors with freshman Jose Cristales taking second. The Panther “Boots” (first year shooters) brought the Boot trophy back home this year soundly defeating all comers by a 12-point margin. The Boot team consisted of Hilda Cristales, Diana Soto, Tyheim Graham, and Julian Egan. Freshman Diana Soto, shooting in only her second match, earned a third-place spot in prone. Nicholas Montaque was 2nd in standing and Tyheim Graham also took a second place in kneeling. The Panther Boots swept the finals with Hilda Cristales taking first, Devon Ingraham capturing second, and Tyheim walking away with third.